While doing this, I heated the sauce in a pan on the stove. Then I microwaved the chicken patties, adding the Provolone to each patty for the last minute. Pasta on the plate, patties next to the pasta, sauce on top. A sprinkle of Parmesan on top. Voila! 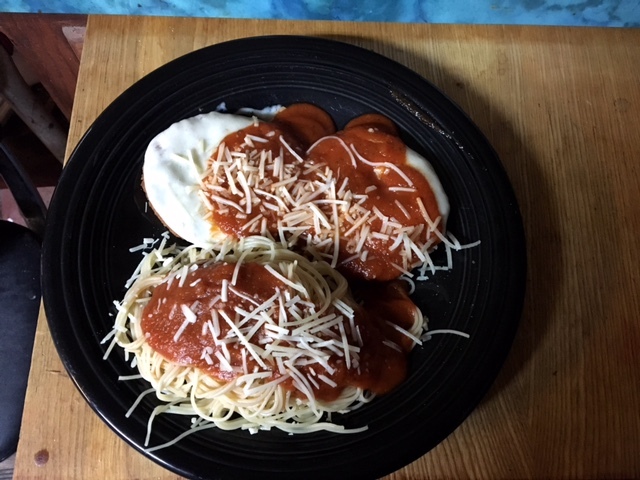 Fast, quick, easy, not as good as restaurant, but… I would do the angel hair the normal way next time. Microwave pasta’s not so yummy. But yeah, I’ll make this again. Do y’all have any quick summer recipes you want to share? This entry was posted in Writing Life and tagged deadlines, food, recipe, stuff, Tuesday Treats. Bookmark the permalink.